Peggy M McAloon is on a mission to inspire kids everywhere to kindness and to empower them to stand up to abuse and bullying. Her "Lessons from Fiori Series" about a young girl from Wisconsin, provides a strong female role model who isn't afraid to show compassion or hack into a con man's computer if the need arises. Peggy's courageous battle with childhood abuse and a traumatic brain injury has enabled her to identify with both children and adults who have suffered from abuse and bullying. She's a retired trainer and speaker in the field of commercial credit. Her first book, "The Art of Business Credit Investigation" was featured in Inc. Magazine. She's been interviewed by the Associated Press and appeared on news shows in her efforts to protect our water resources. Peggy lives by a lake in Wisconsin in a pine forest with her husband and two rescue pups. They love to travel. 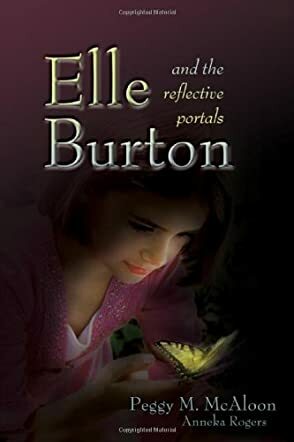 Elle Burton and the Reflective Portals: Lessons from Fiori Book 1 by Peggy M McAloon and Anneka Rogers is an enchanting and fantastical story of Elle, a ten-year-old girl who has this rare gift to see fairy-like Fiorins. Elle’s father is in Afghanistan and she lives with her mother, who is expecting a baby. Elle learns that she has been chosen as a guide by Fiorins, who are tiny winged creatures that help to protect young children on Earth when her younger brother is born. As the story progresses, readers see Elle taking on new challenges and getting involved in protecting a child from an abusive father, helping an overweight girl, and many other instances where she feels her help is needed. This is a story of kindness, enchantment, and magic, and the author weaves the fantasy elements along with life lessons through this whimsical story. The author touches on topics that are relevant when it comes to the struggles faced by children, and readers get to see the protagonist, Elle, dealing with all sorts of issues. The exquisite use of language tones down the harshness of death, bullying etc. and the whimsy in the tale will help young readers enjoy the story as they turn the pages. All the characters are lovable and the monsters and magical creatures add to the fantasy element. Elle Burton’s character will inspire children to follow their passions in life. I like the manner in which the author tackles different issues, thereby giving many layers to the plot. The messages conveyed in the story are profound and uplifting and they will encourage and motivate children to rise above their potential during difficult times so that they can make a difference to this world. Yes, like everyone else, I am waiting for the next book to learn more about Elle’s journey. Elle Burton and the Reflective Portals is the first book in the Lessons from Fiori series, by Peggy M McAloon and Anneka Rogers, that reads like a fairy tale, only it’s so sweet that it leaves readers with the feeling of waking up from a wonderful dream. With her dad away and serving in Afghanistan — and oh how she misses him! — ten-year-old Elle meets a strange being, Eunie Mae, who hails from the fairy world called Fiori. It is not given to many to see Fiorins and those above eight years old who are lucky enough are the Guides. Guides are people specially chosen to protect the destiny of children from the forces of evil. On her birthday, Elle gets the opportunity of a lifetime to become a guide, a vocation that aligns well with her lovely and gentle nature. But she is not aware of what lies ahead of her, for there are forces of darkness that would stop at nothing until they make sure her mission is a failure. Does she have the fight in her to succeed? This is a beautiful story and readers will be gripped from the very start, with the protagonist waking up and being worried about not having completed her assignment. The interesting dialogues begin from the very first page and they are well-written, natural, and plot-driven. Peggy M McAloon’s characters are real and compelling. When we meet the protagonist, we are delighted by her lovely disposition, her lucid nature, but then we begin to learn about her gifts and feel her fears. The author does an amazing job in developing this character and readers will notice how she grows, facing each challenge at a time, and discovering what she is capable of achieving. Elle Burton and the Reflective Portals is one of those books that will remind readers of the magic of fairyland and the gift of angels. It is as inspiring as it is enchanting! Elle Burton and the Reflective Portals by Peggy M. McAloon and Anneka Rogers is a children’s fantasy full of adventure. For Elle Burton, her tenth birthday turns out to be one filled with joy and sadness in equal measure. Her new baby brother arrives, but her father’s helicopter is shot down in Afghanistan. It is also the same day she discovers the existence of the Fiori. Eunie Mae is a fairy-like creature who has come to be a Guardian to Elle’s little brother, JJ. Only, Elle is supposed to be far too old to see a Fiori. As Elle learns more about the good and kind Fiori, she must also face the evil Zorins who want nothing more than to harm and destroy children. Elle Burton and the Reflective Portals is a unique read with familiar yet creative world building. Because the story is told through the eyes of a child, adults can also get an insight into how children feel and think in different situations. I found Elle to be sweet and, at times, grown up beyond her years but quite delightful. The adventures in this book will reach children at an elemental level and teach them some of life’s tough situations. I loved the way the authors contrived to turn an otherwise sad occurrence into a positive one. They tackled sensitive issues in a way that both enlightens and comforts the young reader. I believe children should be well informed about life rather than for them to go through life blindly believing in rainbows and candy. This book embodies that belief. I look forward to reading more books in this series.